It is Christmas time, and the world stops for a brief moment. It does not stop long because there are too many important things to be done to waste on festive and unproductive folly. It can only be a short pause on Christmas day before the world must almost immediately return to the frenetic intemperance of the daily hustle and bustle. But this quick respite is enough to give a most necessary and calm reprieve of sanity, peace and order to our burdened souls. Of course, the world does not stop willingly. It even tries to secure some advantage from this unnecessary break by making frantic attempts to commercialize and secularize the feast. Despite it all, the peace of Christmas somehow prevails. Stopping for Christmas challenges the modern world. To those enmeshed in our secular society, the birth of the Christ Child interrupts their lives with moral considerations that they would prefer not to consider. To practical atheists, Christmas is a curiosity that provokes painful memories of innocence long lost. Shallow Christians find the feast to be a sentimental time for some vague joy that they prefer not to make more profound. All these are somehow threatened by the date; yet all are forced, willing and unwilling, to stop to observe it. However, faithful Christians everywhere are not threatened but strengthened by Christmas. We stop because Christmas reminds us that we are called to live in the presence of an Almighty God of infinite grandeur and majesty. This fact provokes in us a sense of wonder at the immense gulf between the Creator and His creatures. On that ineffable night when our Savior was born to Mary Ever Virgin, an immense impossibility became possible: the God-Man was born and revealed Himself to us. 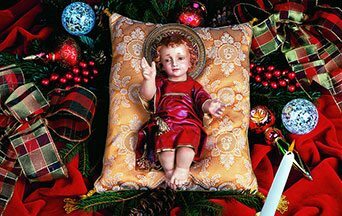 On that holy and silent night, one can sense the sweetness and perfection that emanated from the Divine Infant in the manger in Bethlehem. He who seemed so inaccessible suddenly became accessible to all, kings and shepherds. He who appears so weak became powerful enough to stop the whole world for centuries to come. To honor the grandeur of that sublime moment, we must stop not just once but every year to marvel at this fact that only increases our wonder at this good God that gave to us His only Begotten Son. However, there is yet a greater reason for us to stop and marvel. The Birth of Christ also signaled the coming of a Redeemer who, for love of us, would reestablish the link broken by our first parents. In that marvelous and joyful Birth, we find foreshadowed the sorrows of His Passion. We stop and adore He who was born so that we might be redeemed, saved and united with Him for all eternity. Finally, we stop because Christmas means much more than just our personal salvation. Christ made possible a civilization we call Christian. From the poverty of the manger in Bethlehem, an immensely rich channel of grace was opened for us. From Heaven descended torrents of blessings, which paved the way for the most audacious dreams and the immense possibilities of a world centered on the sublime principles, virtues and teachings of the Gospel. In Christendom, it became possible to practice the Commandments and evangelical counsels, inside an order that the pagan world then judged (and today’s neo-pagan nightmare still judges) impossible. That is why everyone stops for Christmas. The powerful image of the Christ Child still has the capacity of capturing the modern imagination if only for a brief moment, amidst a world of sin and distractions. During the blessed season, the grace of God still reaches out and draws all men of good will toward Him despite so much rejection. Others stop for the wrong reasons. Sadly, some atheists or rationalists stop merely to smirk at such considerations. They do not realize that, by limiting themselves to their sterile musings, they embrace the narrow vision of a soulless and pragmatic world, bereft of wonder. But for those of us who celebrate a Merry Christmas (and not unhappy holidays), we stop at this time every year to recreate a marvelous wonder world visibly expressed by decorated trees, Nativity scenes and joyous caroling that reflect this joyful reality of Christ’s coming. More importantly, we gather inside our souls the peace of the Christ Child that calls us to return to order by realigning ourselves to live in function of a world created by God, turned toward God, and where God shows Himself actively intervening out of love for us. This entry was posted in Catholic Perspective, Return to Order and tagged Catholic, Child, Christ, Christmas, Church, Commandment, Creator, Divine, dream, eternity, faith, frenetic intemperance, God, Gospel, grandeur, Infant, infinite, innocence, judge, King, love, Majesty, man, Mary, modern, Nativity, Order, parent, peace, Redeemer, return, salvation, Savior, shepherd, soul, stop, Virgin, virtue, Why We Stop for Christmas, world by John Horvat II. Bookmark the permalink.